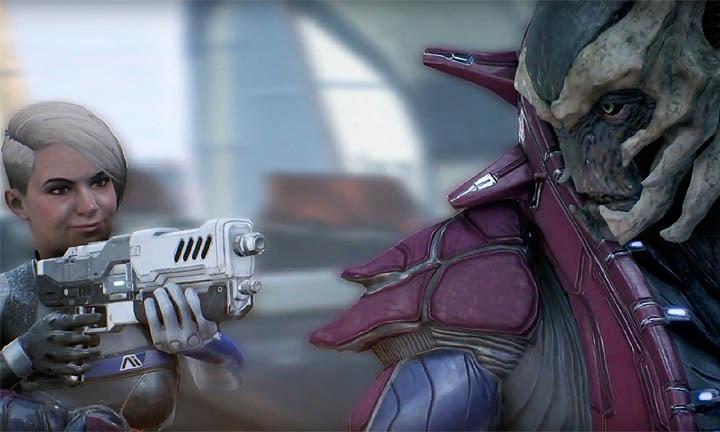 Vetra and Jaal are two of the major companions in Mass Effect Andromeda and as one might expect, they have romance paths for players to progress. In this guide you'll find details explaining exactly how to romance both of these characters including dialogue choices and important locations. 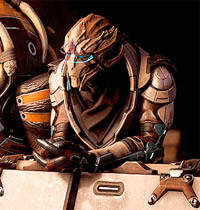 Vetra is a Turian and she accompanies Ryder on missions in person, along with Drack. 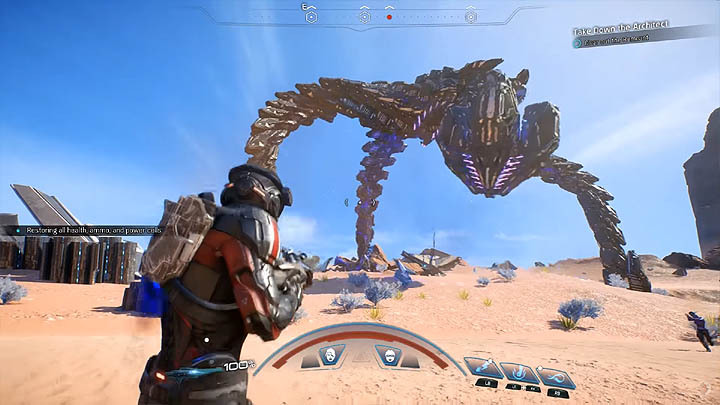 From her past experiences Vetra knows the importance of having someone to watch your back, and as a result she'll go out of her way for the people she considers friends and family. She is commonly found in the Armory area of the Tempest. 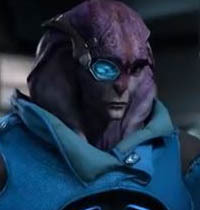 Jaal is the Angaran teammate who joins Ryder's team as an observer for the resistance. In summary, he's a cards on the table, heart on your sleeve guy who doesn't pull any punches. As a species, Angaran's are larger than life and very demonstrative. Jaal is commonly found in the Tech Lab. 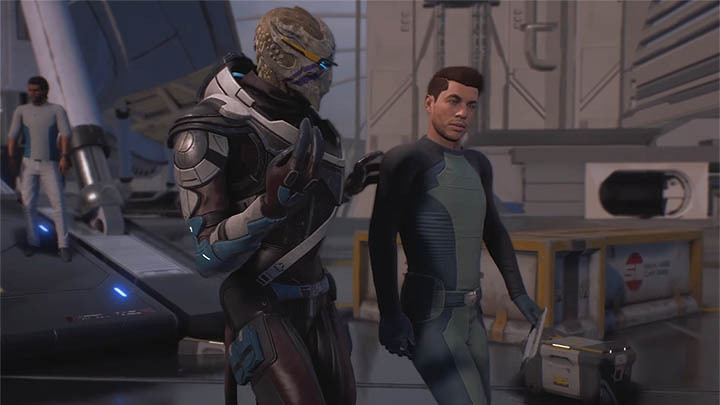 Below are some important observations about both characters; of particular importance is to note that Vetra is bi-sexual whilst Jaal is a straight character, only available to female Ryder. C1: Introduction Tempest armory "You're intense. I like it"
Casual Conversation Any C1 complete "Anyone special in your life"
C2: Opening up Tempest armory C1 complete, a "Trail of Hope" complete "You're too tough for that"
C3: Post loyalty Tempest armory Loyalty mission completed "I'm here for you both"
C4: Dreaming Tempest armory "Hunting the Archon" complete, C3 complete "I'm dreaming of someone"
Note: there is no second conversation (C2) listed below, simply because it has no flirt dialogue but it is important for progressing to C3 and onwards. C1: Introduction Tempest tech lab Recruited Jaal, after Aya, expires after a "Trail of Hope" finished "One more thing"
Casual conversation Any C1 complete "Interested?" C3: Gifts (3rd talk) Tempest tech lab Visited Kadara, C2 complete "I think you're special"
C4 Tempest tech lab "The Journey to Meridian" complete, expires at end of game "I adore you"